Melatonin, N-acetyl-5-methhoxytryptamine, is a molecule with diverse physiological function. It affects reproductive functions in a wide variety of species. This chapter describes the roles of melatonin on various reproductive parameters. 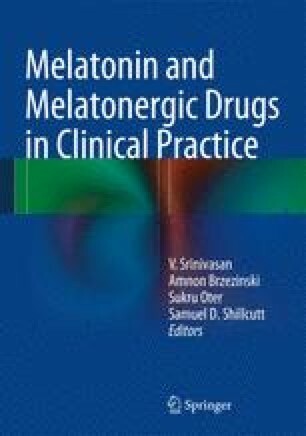 Melatonin has an inhibitory influence on hypothalamic GnRH secretion. Melatonin acts as antioxidant and reduces oxidative stress-induced testicular dysfunctions and poor oocytes quality in many experimental animals. During fetal life, melatonin regulates circadian rhythm and has been suggested to play a role in the regulation of fetal REM and NREM sleep. In adults, melatonin regulates the time of parturition in both humans and nonhuman primates. Many studies have suggested that melatonin could be an effective treatment for preeclampsia, due to its antioxidant properties as well as its antihypertensive and anticonvulsive actions.